Robert Francis (Frank) was born on 12 Dec 1890 at Port Pirie. He was the second son of Robert Fish Atkinson (1857-1922) and Susan Whitelaw (1862-1918). He was a baker and storekeeper and lived in Port Pirie (1890-1896) and at Willunga (1896-1972). In 1923, after the death of Robert Fish Atkinson on 12 August 1922, Thomas Aldam Atkinson (executor) transferred the property at 44 High Street (Lot 84) at the corner of High Street and Bishop Street) to Robert Francis Atkinson and Thomas Fish Atkinson. Frank and Tom ran the Atkinson’s store and bakery at 44 High Street from 1923 until Tom retired in 1967 (44 years). On Tom’s death in 1968 his half share went to his brother Frank (retired storekeeper) and in the same year Frank then transferred the whole of the property to Tom’s widow Hazel May. Robert Francis (Frank) Atkinson (aged 29 years) married Clarice Idonia Lovelock (1894-1970) (aged 25 years) on 14 Jan 1920 at Adelaide. She was the oldest daughter of Henry Lovelock (1865-1957) (who was a farmer at Aldinga) and Ellen Osbourne ( -1936). 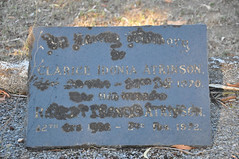 She died, aged 76 years, on 31 May 1970 at McLaren Vale and is buried in St. Stephen’s Cemetery, Willunga. Children – (2 boys) Robert Frank (1921- ) Colin Henry (1924-1930) d aged 6 & buried in St. Stephen’s, Willunga. On 22 Feb 1930 Colin Henry, aged 6 years, second son of Mr and Mrs R. F. Atkinson of Willunga, was killed at Willunga. Colin dashed across from behind a lorry in front of a car. The right mudguard of the motor struck him on the head, knocking him to the ground and killing him instantly. Frank died aged 81 years on 2 Feb 1972 at Glenelg and he is buried in St. Stephen’s Cemetery, Willunga. Do you remember Atkinson, Robert Francis (Frank) ? Then Join up and add your memory here.